Simply toast the seeds in a dry frying pan until fragrant, shaking a pan so that they don’t burn. Place them in a mortar and pestle or food processor to combine all together. Let it cool and keep in a air-tight jar. To make a harissa paste, mix equal parts spice with boiling water. Let it sit for 5 minutes then add a good quality of olive oil until you get a paste consistency. Simple! Heat coconut oil in a pan over medium heat. Add sliced carrots and harissa spice mix into a pan and stir well until carrots are well coated with oil and spice. Stir occasionally for 10-15 minutes until cooked. 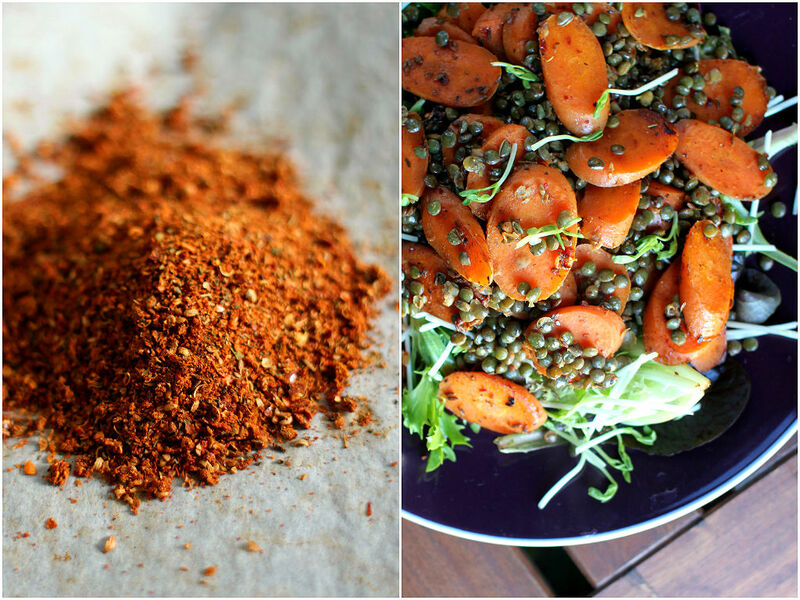 Combine with cooked lentils, salad mix and snow pea shoots in a large bowl. Taste and adjust seasoning. Serve warm. It goes well with any kind of grilled meat, tofu or even toasted bread.